On Saturday, March 30, 2013, members of the East Central Chapter of the Mississippi Police Benevolent Association conducted a fundraiser for Chief Randy Boykin’s family. The fundraiser took place at Lowe’s Home Improvement in Meridian, Mississippi. Hundreds of local citizens came out to support Chief Randy Boykin’s family and made heartfelt contributions. 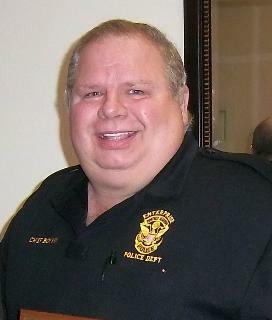 Chief Boykin served as Chief of Police in Enterprise, Mississippi for roughly 12 years. He was an active member of Mississippi Police Benevolent Association (MS PBA) for 15 years. Chief Boykin joined the association in 1998. Chief Boykin was well respected and liked within the law enforcement profession and his community. He will surely be missed. He gave his all in service to his community, and on March 19, 2013, he gave his life. Now it is time for us to be there when his family needs us the most. The Mississippi Police Benevolent Association and the Police Benevolent Foundation want to thank the community for their overwhelming love and support for Chief Boykin’s family. If you missed the event and wish to contribute, donations can be made directly to the “Chief Randy Boykin Memorial Fund” online through Police Benevolent Foundation by clicking the link below. 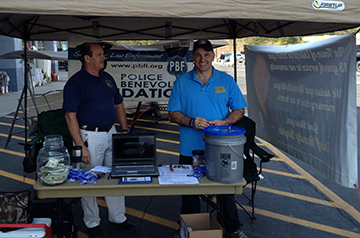 All online donations need to be designated to the Chief Randy Boykin Memorial Fund through the PBF’s donation page. Area residents can also make a donation by stopping by any area Region’s Bank through the Police Benevolent Foundation’s account designated for the Chief Randy Boykin Memorial Fund. All donations made to this memorial fund are tax-deductible and 100% of the money will go to Chief Randy Boykin’s beneficiaries. **PLEASE BE SURE TO DESIGNATE THAT YOU WOULD LIKE YOUR DONATION TO GO TO THE "CHIEF RANDY BOYKIN MEMORIAL FUND" IN THE DESIGNATION BOX ON THE DONATION FORM. "CHIEF RANDY BOYKIN MEMORIAL FUND"
The Police Benevolent Foundation is also taking donations via text for the “Chief Randy Boykin Memorial Fund.” You can help by texting the phrase COPS BOYKIN to 85944. A $10 donation will be made through your cell phone bill. The PBF is asking everyone to please pass this information along to friends and family. Chief Randy Boykin’s family will need all of us to rally behind them in these hard times. The Police Benevolent Foundation, Inc. and the Mississippi Division of the Southern States PBA are rallying behind the family of Meridian Police Officer Luke Castillo. Castillo passed away at his home on June 11th. On Saturday, March 30, 2013, members of the East Central Chapter of the Mississippi Police Benevolent Association conducted a fundraiser for Chief Randy Boykin's family. The fundraiser took place at Lowe's Home Improvement in Meridian, Mississippi. 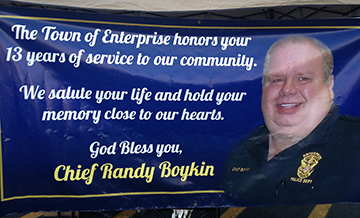 Hundreds of local citizens came out to support Chief Randy Boykin's family and made heartfelt contributions. 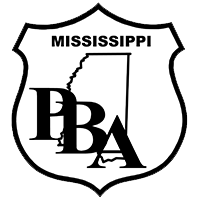 Members from the East Central Chapter of the Mississippi PBA will be hosting a fundraiser at the Lowe?s Home Improvement Store in Meridian located at 100 15th Place South near Bonita Lakes on Saturday, March 30th from 7:00am to 4:00pm.